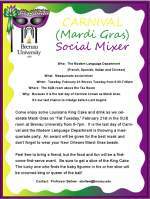 Under the guidance of Dr. Shelton Bellew, the modern language faculty is hosting a Carnival/Mardi Gras party in the SUB Tuesday, Feb.21 from 6 to 7p.m. There will be a King Cake and other refreshments as well as a Best Mask competition. All interested faculty, staff, and students are invited. Costume not required but recommended.